I’d always wanted to run my own business. I had a marketing background and when I was in my mid-twenties I thought it was time to start looking at what I might do. 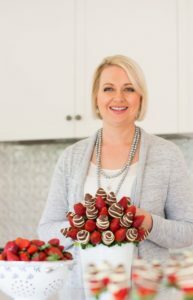 I actually started out on a small scale, with fresh fruit bouquets at a very small concept store but very quickly we broadened the product range and increased our geographic reach because with fresh fruit we could only service customers in that one city. There was interest and demand very quickly from around Australia so we expanded to a national footprint within our first 12 months. We added chocolate bouquets, cookie bouquets and gourmet hampers. It was an incredibly busy first couple of years and we grew quite quickly. When I first started the business I wasn’t sure if it would be a more traditional corner store or high street retail business, or e-commerce. As a self funded start up I couldn’t afford a high street retail site, so e-commerce was really important to develop income and enable customer accessibility and convenience. The category of flower delivery was an early adopter to online sales because of the convenience of being able to order online and deliver to remotely located family and friends. When someone can’t get to see their Mum, or doesn’t have the time to run around in person with a thank you gift, we fulfil the service to deliver a heartfelt message for our customers – with a difference. The online presence has been critical from day one. We’ve had a fully transactional e-commerce store from the very first day our doors opened. Our first big marketing investment was taking a stand at the very first Brisbane Good Food and Wine Show. I was fortunate to be asked to feature on the live cross with Stevie Jacobs and the Today Show crew the morning the day it was opening. That was such an amazing opportunity for a brand new business, to get national television exposure. Stevie Jacobs was great, we had a lot of fun and he did a great job of smearing our chocolate fudge all over his teeth, and that suited our brand, too; it’s a fun and engaging brand. I was inspired by many sources to start up a niche concept creating floral like bouquets that you can eat and delivering them across the country. However, it wasn’t easy in the beginning. People would look at me strangely when I tried to explain it but as soon as they saw pictures, or an actual bouquet, they were captivated by the common sense of combining food and flowers into a gorgeous presentation. My inspiration to think differently started from my country upbringing. Creativity was encouraged in our family and I later attended boarding school for my secondary education. This meant I had a geographically widespread friendship group and as someone who was always particular about the flowers I sent on special occasions, I was often frustrated when I ordered a bouquet online and the actual delivery didn’t look anything like the picture I had carefully selected. So it was only natural that my gut instinct was screaming ‘yes’ to combine the concept of food and flowers in a gift delivery which enabled consistency in the production process. So there were lots of things coming together that led me to that conclusion: an edible bouquet. Before opening the doors, there was lots of product sampling and trialling and taking test bouquets to dinner parties with friends and asking for opinions. One of the hard things when you’re starting out with a new concept is working out what to charge. I always tried to model our product development around the price of delivered flowers; we wanted to be have a comparable price point to traditional flowers but offer something with a modern twist. Knowing exactly what you’re going to get is so important and we have made it a point to be consistent. No matter which of our stores send the bouquet, it will look the same as it appears on the website, the same colour ribbon, the same items. It’s like a recipe – and we share the contents clearly on every product description online. People can have that peace of mind when they order online knowing that what they are seeing is what we are delivering. Actually we always get told they look better in real life; it’s hard to catch what they really look like with a photograph! I have to say, I’ve had so many different obstacles that have cropped up along the way. A big one for us though, was we had just started to get a bit of money in the bank and get our feet under us after the start-up years when the global financial crisis hit. Like many other businesses, the timing for us was really difficult. We’d been struggling with a lot of manual processing systems and we’d just committed to a big software investment to use the cloud, as well as acquiring our first commercial building, and we’d put on our first employee that wasn’t my sister or myself, so we’d committed to computer equipment and servers. We had to have a crisis meeting and work out how we were going to survive the new economic conditions. Rather than panic, we took a deep breath, paused and stepped back to analyse the path forward. And we realised that even when times are tough, people will still need to send gifts. Babies are going to be born, people are going to have anniversaries and birthdays. But the difference is that they might spend less per transaction. So what we did was solve it with some innovative product development. We created a gift range of under $50 gifts so people could affordably send things. We traded out that year with 30% revenue growth, which was really good. To this day we still have a large range in that same price point category. When you have that moment of crisis, the lesson we learnt is to always put what your customers want first, and then design the solution that solves a customer’s problem. Solving a customer’s problem often solves your business’s problem. Then the next year we won the Telstra Business Awards for Australia, so that was a pretty remarkable turnaround! I’d like to think that our successful GFC strategy and consistently putting our customer needs first was our key to winning. It’s a key question we ask ourselves: what does the customer want? We were early adopters of the Net Promoter Score (NPS) which is a popular way of hearing from your customers. It measures how likely your customers are to return again. So two days after we’ve delivered every Edible Bloom we send a simple email to our customer who ordered the gift and ask how happy they are with the gift and to give a score out of ten. They click on stars to rate us out of ten and there’s a text box where they can add comments if they want to. We measure every month by location and we measure nationally. With the way the scoring system works some companies can get a negative score; a high score for a retail score is 59 out of 100. Edible Blooms is consistently scoring over 80 out of 100. It’s our litmus test every month to make sure our customers our happy. This is also a useful way of capturing any problems. We follow up with anyone who gives us a score of 6 or less, or who gives us some feedback that something didn’t go right, and we make sure we fix any problems. It’s really critical to have good customer care. Social media is definitely a focus for us. We spend a lot of time on our social media strategy and pushing out content that the customers actually want to see. It’s an important part of communications now for any company, it doesn’t matter what industry you are in. For us it is really important. We use Instagram a lot, because we have a visual product, and we use Facebook too. It’s been critical for us to remain agile and respond to changes in consumer behaviour. We’re seeing a lot more conversions now from mobiles, for instance. I just think the pace of change is getting faster all the time. You have to be up to date with technology. It’s been a fortunate choice for us that we adopted cloud technology so early. We use experts to manage our technological needs. We use a platform called Neto, and they’ve been a fantastic partner for us. If I did have my time again I would get on board with social media earlier. We were an early adopter there too, but I was a bit sceptical about the benefits and I didn’t see a good return on the investment of the huge amounts of time it took, so we stepped back until it became a platform to generate customer leads. You have to be engaged with social media now, our customers expect it. I think now it’s really become a hygiene aspect of business. It’s good practice for everyone. With social media: I’ve learned it’s best not to try to do everything, figure out which channels work for you and do less, but do it better. Test your ideas and your products out early! Don’t hold back, thinking you can’t put it out there or that someone might take your idea. Ideas are plentiful, but turning ideas into a commercial reality is the challenging part of the equation. Now with social media and technology it isn’t expensive to test an idea before you then put everything behind it to make it happen. Ask, what is the minimum viable product I can test? What is the cheapest way I can test my idea before I throw my house on it? Don’t ask what do I want to do, ask what do my customers want? When you are starting out you have to juggle a lot of balls. Choose the key things that are going to give you a return and focus on doing them really well. Ideas are plentiful, but it’s the people who can follow through with it and action a plan that gets them through to the finish line who succeed. You need continual testing and implementation. We’ve had a lot of products we put out there, that didn’t do well. And that’s OK. If customers are telling you they don’t like it, pull that product and put another one out that they’ll love. You have to have a realistic expectation. It’s not going to be easy; you are going to hit roadblocks. It’s really important to understand that not everything you try when you’re starting a new business actually works straight away. It’s easy to look at a business that’s where ours is now and think it’s easy. It isn’t.